In this chapter the role and impact of community service work, volunteerism, and stewardship activities is addressed in relation to how community members may perceive and experience a greater sense of “connectedness” with each other and to the community itself. Additionally, evidence is explored (i.e., Buss, Evolutionary Psychology: The New Science of the Mind, 2015) in addressing how cooperative and altruistic behaviors may have evolved to strengthen communities and improve resiliency among human development. 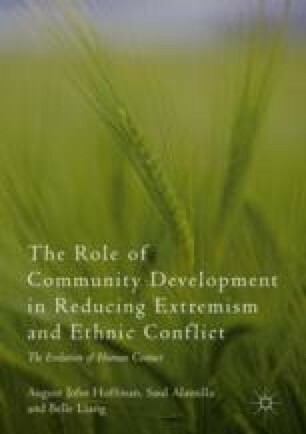 Research addressing the viability of superordinate and interdependent goals (i.e., Sherif, Harvey, White, Hood, & Sherif, Intergroup Conflict and Cooperation: The Robber’s Cave Experiment, 1961) as effective processes in overcoming ethnic conflict and extremism is presented. Zulu phrase as quoted by Desmond Tutu (“A person becomes a person through engagement with others”) (Jill D. McLeigh (2015). Creating conditions that promote trust and participation by young people … why it matters. American Journal of Orthopsychiatry, 85(6), S67–S69).